Added protection for added peace of mind. Supplements basic ElderShield with higher benefits while stretching coverage up to a lifetime. treatment and long﻿-﻿term care costs. 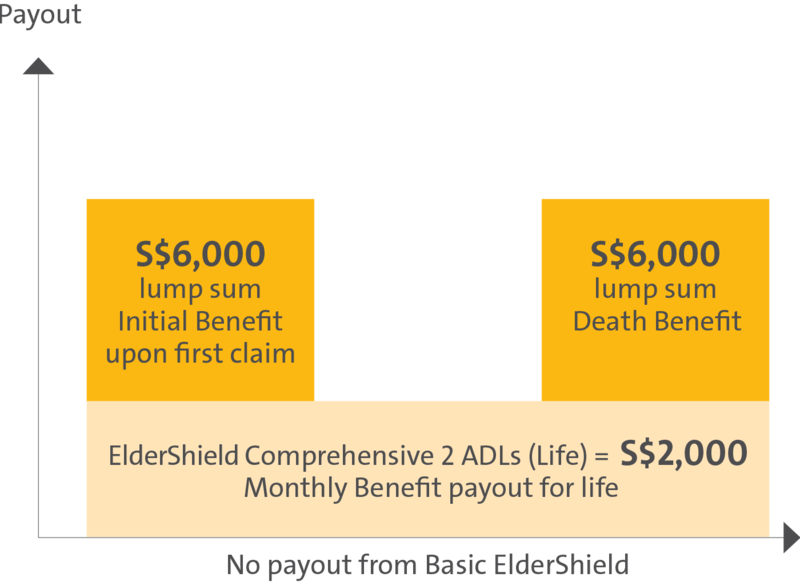 Basic ElderShield commences Monthly Benefit payouts upon your inability to perform at least 3 out of 6 ADLs. You can be assured of early care as ElderShield Comprehensive 2 ADLs accelerates Monthly Benefit payouts when you are unable to perform at least 2 out of 6 ADLs. With ElderShield Comprehensive, you can choose Monthly Benefit payouts of between S$300 to S$3,000 on top of your basic ElderShield. Ensure peace of mind with Monthly Benefit payouts that continue as long as you suffer from severe disability. You can choose the plan type to receive the Monthly Benefit for up to 10 years or up to a lifetime. Upon your first claim, ElderShield Comprehensive provides a lump sum Initial Benefit on top of your Monthly Benefit payouts. The lump sum Initial Benefit is equivalent to three times the Monthly Benefit, payable after a 90-day deferment period. While receiving your Monthly Benefit payouts, in the event of Death, ElderShield Comprehensive provides a lump sum equivalent to three times the Monthly Benefit, and this can help with final expenses. Basic ElderShield is a severe disability insurance scheme which provides basic financial protection to those who need long-term care. In the event of losing the ability to perform at least 3 out of 6 Activities of Daily Living (ADLs), you will receive up to S$400 Monthly Benefit payouts for up to six years. Singapore Citizens and Permanent Residents with MediSave accounts are automatically covered by basic ElderShield at age 40, unless they opt out of the scheme. Is the basic ElderShield enough to provide for your long-term care needs? It might be, but can you afford to take that chance? Long-term care can be very costly, especially if you are unable to care for yourself for an extended period of time. As most people are not able to save enough money for their own long-term care, the financial burden falls to their loved ones who will have to juggle between work and caregiving obligations. For ElderShield Comprehensive 2 ADLs, severe disability refers to the inability to perform a minimum of 2 out of 6 ADLs. For ElderShield Comprehensive 3 ADLs, severe disability refers to the inability to perform a minimum of 3 out of 6 ADLs. The ability to wash in the bath or shower (including getting into and out of the bath or shower) or wash by other means. The ability to put on, take off, secure and unfasten all garments and, as appropriate, any braces, articial limbs or other surgical or medical appliances. We provide you with Monthly Benefit payouts from as early as when you cannot perform 2 ADLs. 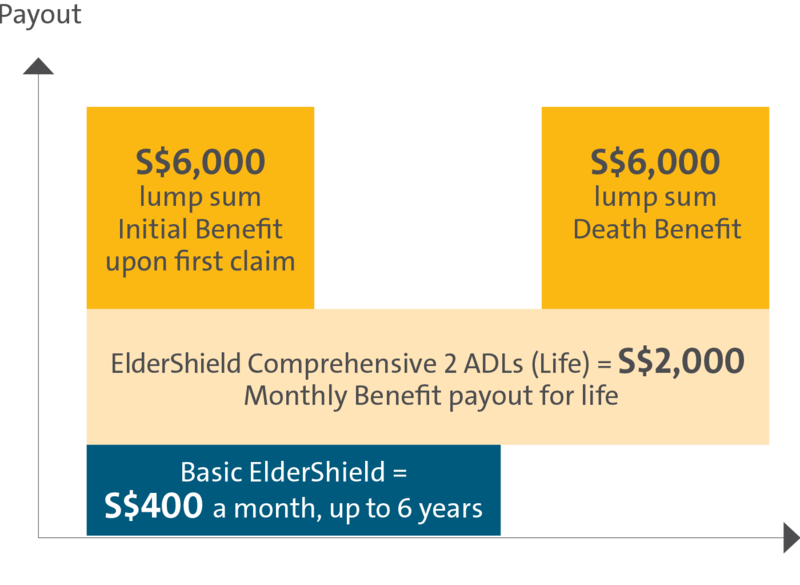 Illustrations shown below are based on S$2,000 Monthly Benefit from ElderShield Comprehensive 2 ADLs (Life). The S$600 limit applies to ElderShield Supplements provided by Great Eastern Life like ElderShield ValuePlus, ElderShield Comprehensive, as well as other ElderShield Supplements plans with other insurers. View premium rates for males here. View premium rates for females here. The plan is protected under the Policy Owners' Protection Scheme which is administered by the Singapore Deposit Insurance Corporation (SDIC). Coverage for your policy is automatic and no further action is required from you. For more information on the types of benefits that are covered under the scheme as well as the limits of coverage, where applicable, please contact us or visit the Life Insurance Association (LIA) or SDIC websites (www.lia.org.sg or www.sdic.org.sg). ElderShield Comprehensive is provided by The Great Eastern Life Assurance Company Limited, a wholly owned subsidiary of Great Eastern Holdings Limited and a member of the OCBC Group. This plan is not a bank deposit and OCBC Bank does not guarantee or have any obligations in connection with it. The above is for general information only and does not take into account your particular investment and protection aims, financial situation or needs. You should seek advice from a financial adviser before committing to a purchase. Otherwise, you should consider the suitability of the policy. If you decide that the policy is not suitable after purchasing it, you may terminate the policy in accordance with the free look provision, if any, and the insurer may recover from you any expense incurred by the insurer in underwriting the policy. It is not a contract of insurance. The precise terms and conditions of this insurance plan are specified in the policy contract. It is usually detrimental to replace an existing accident and health plan with a new one. A penalty may be imposed for early plan termination and the new plan may cost more, or have less benefits at the same cost. Note: All ages specified refer to age last birthday. Actual rates may differ due to rounding. Premium rates quoted are inclusive of 7% GST, not guaranteed and may be amended at policy renewal at the discretion of the company, after a notice period of 45 days is given.